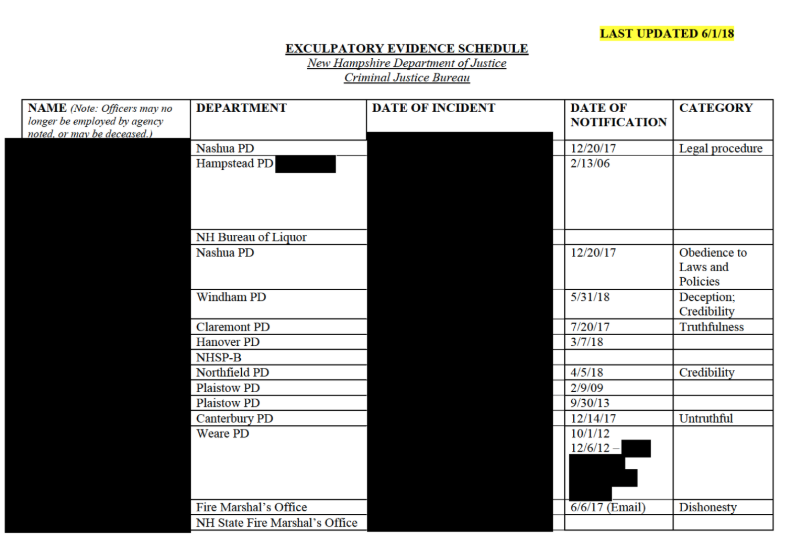 Photo of the Exculpatory Evidence Schedule including the redacted names of dishonest officers. CONCORD – A bill that would make public serious police disciplinary records has passed the House Judiciary Committee. State Rep. Paul Berch, D-Westmoreland, a retired public defender who sponsored the measure, said House Bill 153 passed Tuesday on a vote of 16-3. It now goes to the full House of Representatives for a vote. Find the latest redacted Laurie List of police officers who have been disciplined for dishonesty or excessive force here. It was updated on Nov. 29, 2018. He said the bill would make the disciplinary records subject to the state’s right-to-know if the case involves a police officer’s lethal use of a firearm, an officer is found guilty of sexual assault or “a sustained finding was made of dishonesty,” including perjury. At a hearing on the bill last month. Det. Sgt. Marc Beaudoin, president of the New Hampshire Troopers Association, said there would be “unintended consequences” of opening an entire personnel file to the public because other officers who witness misconduct are compelled to answer questions or lose their job. He told the House Judiciary Committee during a public hearing at the Legislative Office Building that the bill may be acceptable if only a summary of the discipline was made public. But the bill, as passed by Judiciary, does not include such a summary. It, however, states that nothing in the measure shall limit the ability of a public body to withhold names and information of victims or other private persons where disclosure would constitute an invasion of privacy. Gilles Bissonnette, legal director for the American Civil Liberties Union of New Hampshire, was not available for comment after the vote. He said making available only a brief summary does not give the public the context to know if authorities are doing their job. Redactions are routine, he added, and could be made while leaving the document intact. ACLU-NH and news outlets across the state jointly filed a right-to-know lawsuit against Attorney General Gordon MacDonald to release the redacted 249 names of dishonest officers on the so-called Laurie List. The list, now called the Exculpatory Evidence Schedule, includes law enforcement personnel who have been disciplined for misconduct that calls into question their truthfulness or use of excessive force. The lawsuit will be heard Feb. 25 at 11 a.m. in Hillsborough County Superior Court South in Nashua.